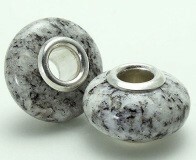 Fine Grey 13mm -Beads of New Hampshire: Fine Grey Granite. The first beads in the American Bead Collection were originally cut from the center cut-out portions of the Sunapee Circles of Hope Ornaments. 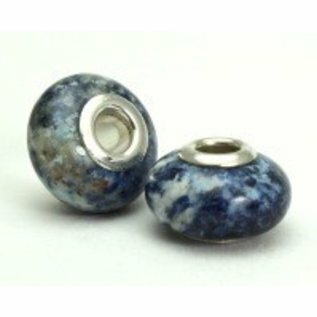 They hail from the bedrock of Sunapee, NH and are handcrafted by the artisans of Sunapee Graniteworks. 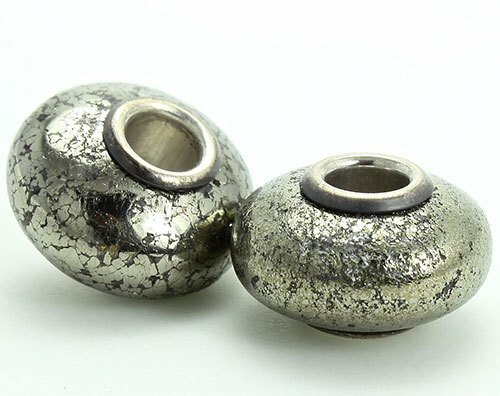 They have a universal-sized sterling core. 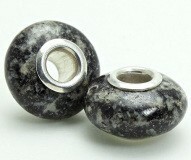 Black Pearl 13mm - The Beads of New Hampshire: Black Pearl Granite were the second bead in the American Bead Collection and come from the Sunapee Graniteworks Quarries In Sunapee, NH. Black Pearl has a rich history in Sunapee since it was quarried in Sunapee Harbor in the 1800's. Once they no longer quarried it, it was forgotten about and then considered a "lost granite" until Bill Stocker and his sons rediscovered it on their land. 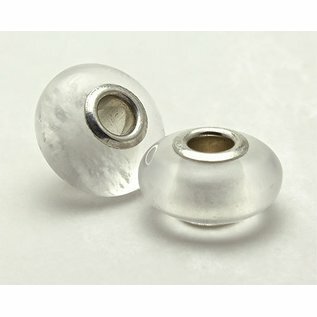 The Black Pearl makes a beautiful bead with a universal sized sterling core. 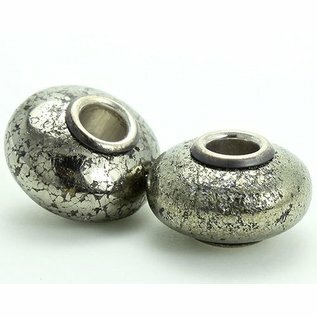 Chalcopyrite 13mm - This stone is Chalcopyrite. It is a stone from Milan, NH and we acquired it from the Robert Whitmore collection. Chalcopyrite has many metaphysical properties and is known to enhance your perception. It is frequently used in meditation. Palermo Ice 13mm - The Beads of New Hampshire Palermo Ice The beads are crafted from Palermo Ice Quartz from the Palermo #1 Mine in North Groton, NH. Quartz is the most versatile and powerful stone; known to attract love and prosperity. Scorzalite 13mm - NH Scorzalite is a rare phosphate mineral that was discovered by Robert Whitmore in 1974 at the Palermo #1 Mine in North Groton, NH. Scorzalite is a member of the Lazulite family and is said to strengthen self-discipline and focus while increasing psychic abilities. 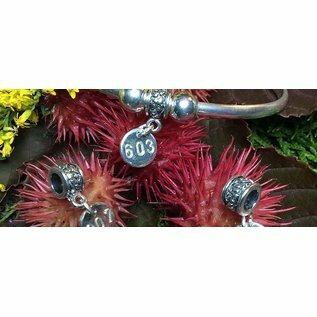 603 Charm - This 603 charm shows your pride in your state, or where you went to school, vacation, or where your family resides. The front has your area code; the back has the heart, making the statement that you love your state. 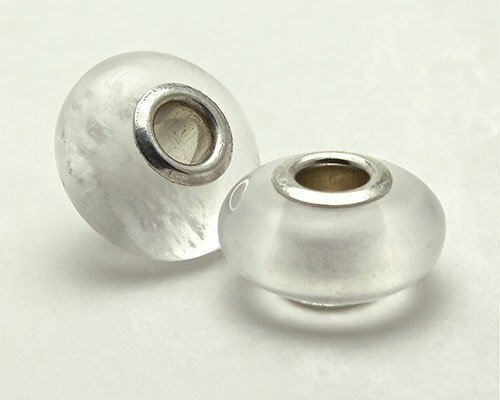 Handcrafted from 925 sterling silver. 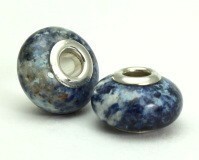 Created by American Bead Collection in New Hampshire. "Our passion is to represent America through her varied & spectacular bedrock, keep America's foundation close, wear a little part of her every day."